This CS80 is currently located at our restoration partners – KSR in Surrey, UK. 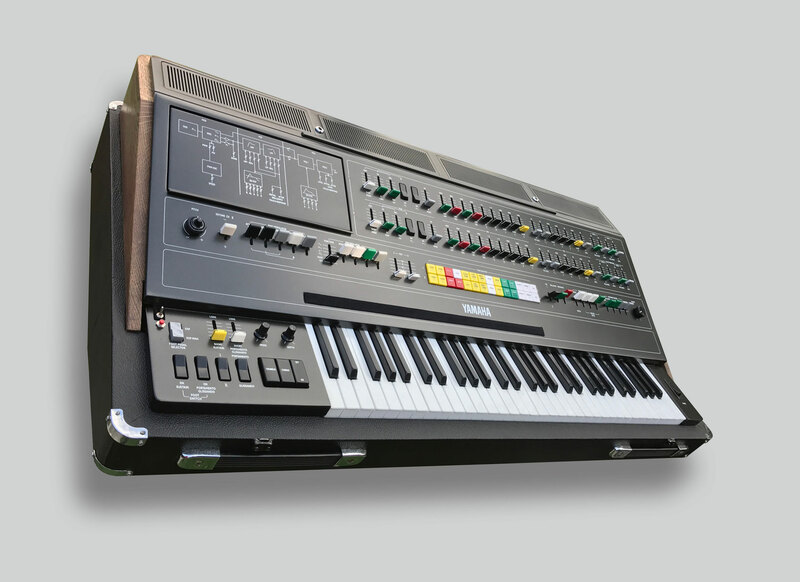 This CS80 is one of two exemplary condition examples that we own on in our private vintage synth collection. We are looking to fund some exciting new projects going forward, so have decided to release one of these CS80 to public sale. The CS80 we are offering for sale could be considered among of the finest examples in the world. It is still a 40 year old instrument with its original keys & buttons etc., but the restoration work invested into it, plus the modifications listed below, mean this is a very special machine, and we have produced only a small number of these very high-level restored examples in the last 15 years for discerning customers around the world. The CS80 has already been fully cosmetically and operationally restored (Level 2) by KSR. Only RL Music get the ‘’Level 2’ restoration as this includes a much higher level of detailed restoration by KSR, including a full key-bed restoration and point-to-point cabling/solder-contacts integrity checking for the entire loom etc. The Level 2 operational restoration normally costs £3000 GBP. We’re pleased to confirm this CS80 already had this work applied of course, and is included in the sale price. The restoration comprises (not limited to) the total replacement of all the old CMOS Logic IC’s, all of the dual op-amps, voice card, and power supply capacitors & transistors. In addition to this the TKC circuit board, which controls the polyphonic after touch of the CS80, is fitted with a set of bypass/decoupling capacitors for each IC to greatly reduce the chance of failure of the touch response circuit. To cap this off, a full calibration is then performed (voltages to within within 3 decimal places). The actual list of work is huge, and changes out several hundred components, and includes a 7 day burn-in test period/stress testing. In addition, RL Music purchased a matched set of VCO for the CS80 about 5 years ago, so the synth has a beautiful set of late production version IG-series VCO ICs. The full set would cost around £2500 to £3000 to source these days, that’s if you could even find them (unlikely), but we’re pleased to confirm this is included in the sale price. The original earlier production version IG-IC’s from this CS80 (production serial #12xx) were rotated into our spares during the restoration (not for sale). The CS80 is sold with a 6 month warranty as standard which covers all parts and labour and telephone/Skype technical support. KSR also provide full 12 month after-sales technical support for the CS80 by phone, email and Skype post-warranty. KSR are world renown CS80 experts and currently support several hundred CS80 around the world for professional musicians/studios and enthusiasts etc. If Midi is required on the CS80 then we are normally able to supply and install the Kenton Midi retrofit Kits for an additional £850 GBP. We’re pleased to confirm this CS80 already has a brand new MIDI kit fitted, and the supply and installation is included in the sale price. All aspects of the CS80 cosmetic presentation are addressed including re-tolexing all the exterior (and lid), re-painting and screen printing all control surfaces. This work normally takes up to 12 weeks to complete. For more information on what is included in this ultimate upgrade option then please call or email us for details. The Total-Restoration Cosmetic Upgrade Option costs £3000 GBP. We’re pleased to confirm this CS80 already had the Total-Restoration Cosmetic Upgrade applied, and is included in the sale price. Solid wood surround (in Oak) beautifully hand crafted by Lamond Design, is normally supplied for an additional £750 GBP. We’re pleased to confirm this CS80 already has a solid Oak surround fitted, and is included in the sale price. KSR have designed the special modification for the CS80 (The Cascade Unison Mod ) so that if you press a single note then you get all 16 VCOs but if you press 2 notes together then it’s 8 voices per note..then 4 notes its 4 VCO’s per note etc etc. Thus meaning that it’s a kind of polyphonic unison, and offers new creative control of the powerful sound the CS80 delivers. Nearly all CS80′s we have sold in the last few years have had these fitted and it definitely adds great sonic value with no impact on the systems reliability or longevity. The Cascade Unison Mod costs £850 GBP. We’re pleased to confirm this CS80 already has a Cascade Unison Mod fitted, and is included in the sale price. Most CS80′s have lost their ‘Pedals, Music Stand and Legs’ over the years, so we are unable to supply these original accessories to the new owner, and this example for sale does not have any either. However, this CS80 does come with the original lid, which has been re telexed of course. We will supply a copy of the owners manual on PDF. The CS80 has been safely kept in our secure storage for a while, so well be asking KSR to go over the instrument in detail once it has been sold & secured on deposit. The service/health-check will only take a short time, but included in this pre-shipping preparation will be a system-wide calibration & test. This CS80 operates on EU220V, but can be converted to US110V if required (subject to quotation). We can have the CS80 professionally packed (custom crated) and shipped pretty much anywhere in the world (subject to quotation). Price: With ‘average to tatty’ cosmetic condition, and fault ridden examples of CS80 selling on eBay for £17,000+ GBP, we are inviting offers for this superlative example, so please email us with yours. Availability: This CS80 is now SOLD as at 7th June 2017. Picture of the actual CS80 for sale below. We took these in-situ at the KSR workshop on 31st May 2017, where the CS80 currently is available to demo (upon request). More pictures to follow shortly.